I’ve been excited to write up this post since the day I first heard about Umai via Reddit over a month ago. They weren’t even open yet but the menu looked insane. 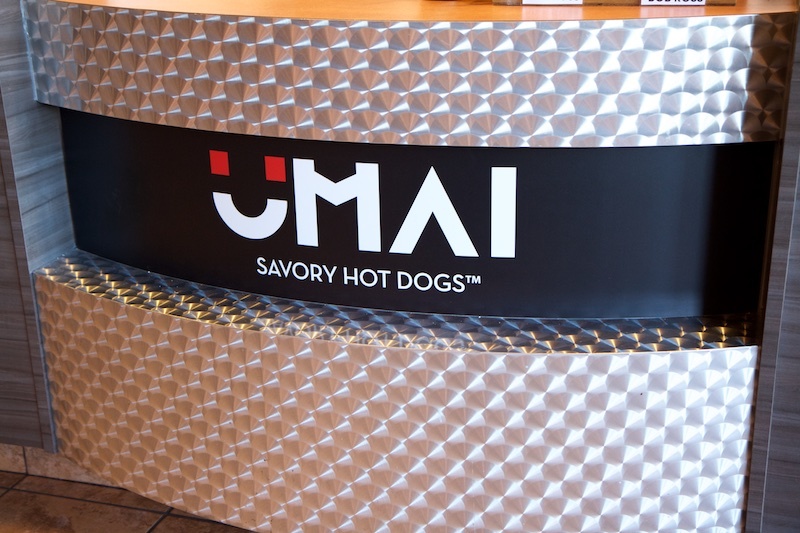 So what is Umai? Obviously it is a hot dog place, but it’s very different than a typical diner like Parkers, or even the now-closed Knucklehead’s. 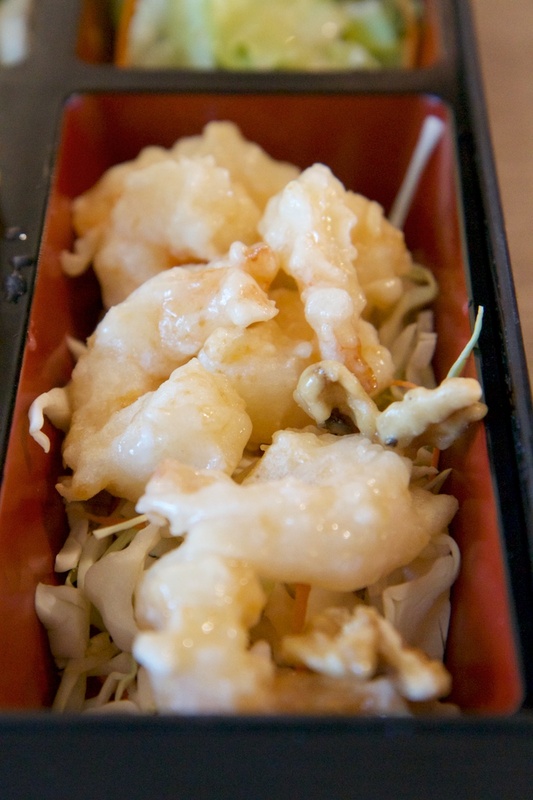 Umai is Japanese Fusion, so you’ll se a lot of flavors/ingredients that you wouldn’t normally associate with hot dogs such as furikake, roasted nori, panko, bonito flakes, and sauces that include unagi, wasabi and teriyaki, among many, many others. 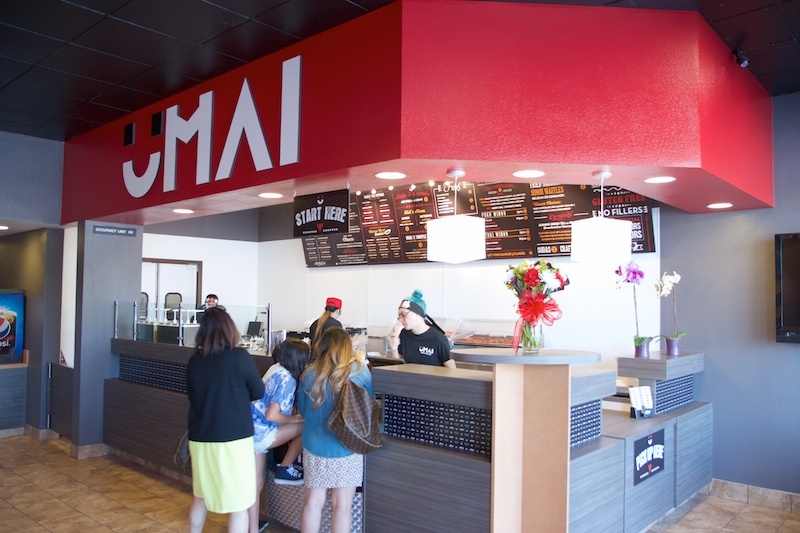 Umai opened 3 weeks ago and I couldn’t resist going on the opening day to check it out. I returned again today to do a proper review now that they’ve had some time to settle in. 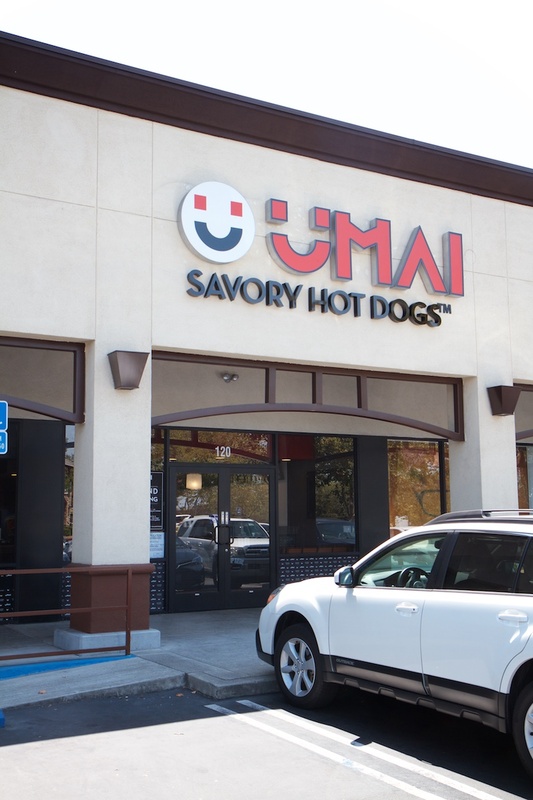 Umai is located across from the Galleria, in-between Stanton Optical and Blast 825º. When I arrived on the first day it was close to 2PM and they had recovered from the first lunch rush. There was one other customer at the time. They had a row of tables running down the long wall, where they have a nice looking menu set up describing all the different signature dogs (21 of them). I thought this was a little awkward because you’d basically be staring right above someones head to see it. Since then, they have received more tables and rearranged the seating a bit. You’re still looking past people to see the menu, but at least they are now turned 90º from you and it should’t be quite as weird feeling. At the register, like many places, they have a tip jar but they have fun with it and make it a vote that they change often. 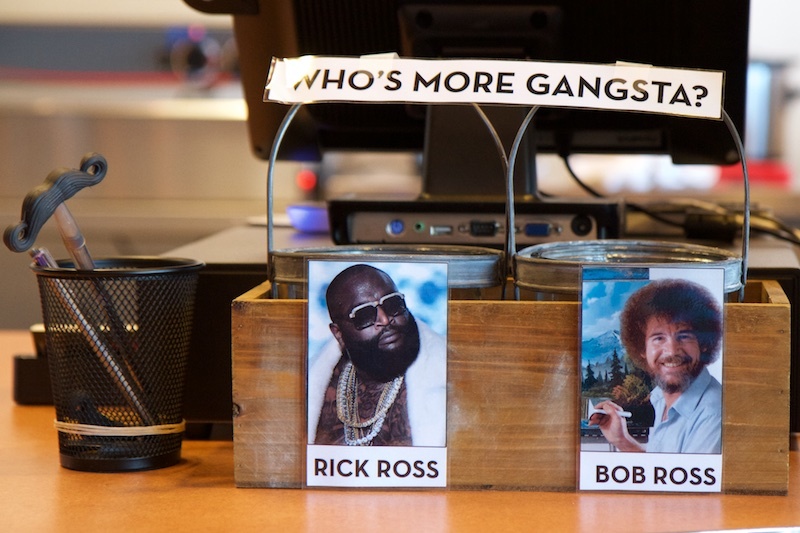 Today was Rick Ross vs Bob Ross. 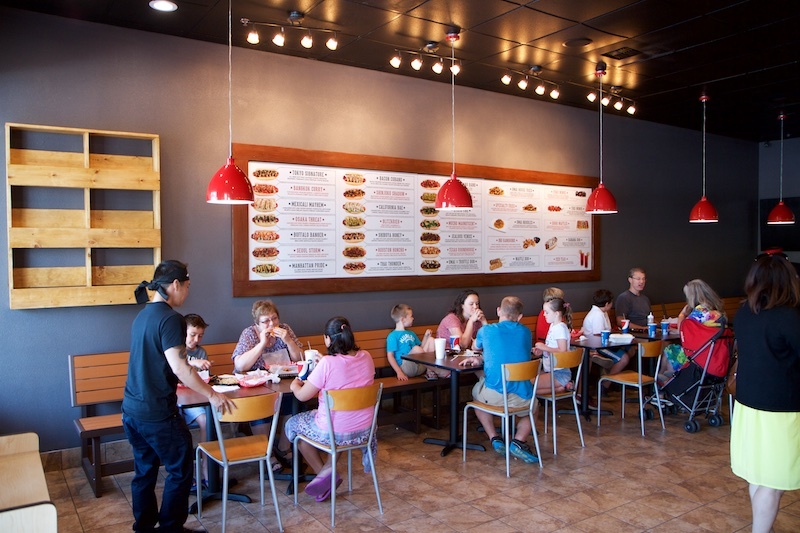 The menu is large and overwhelming, but both times the staff were helpful in explaining options, describing flavors and offering recommendations while also being very patient. For my first visit I had already picked out my dog well in advance. 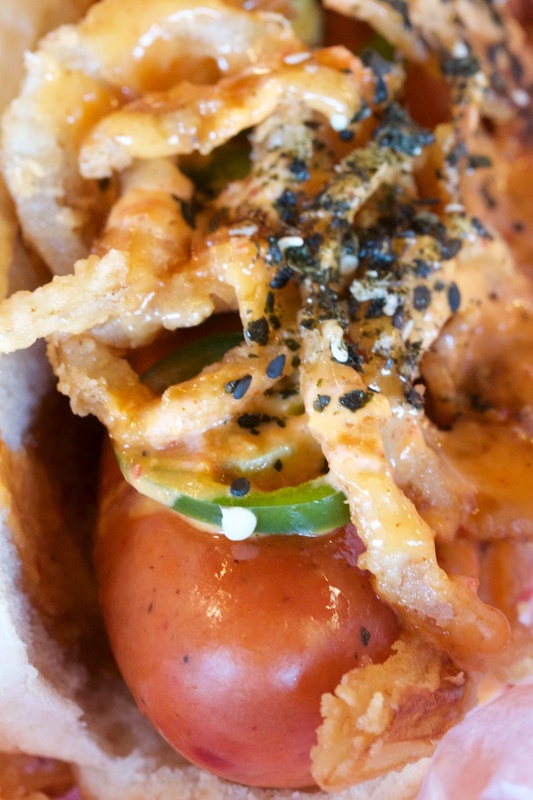 The Umai X Truffle Dog called my name from the moment I saw it online. 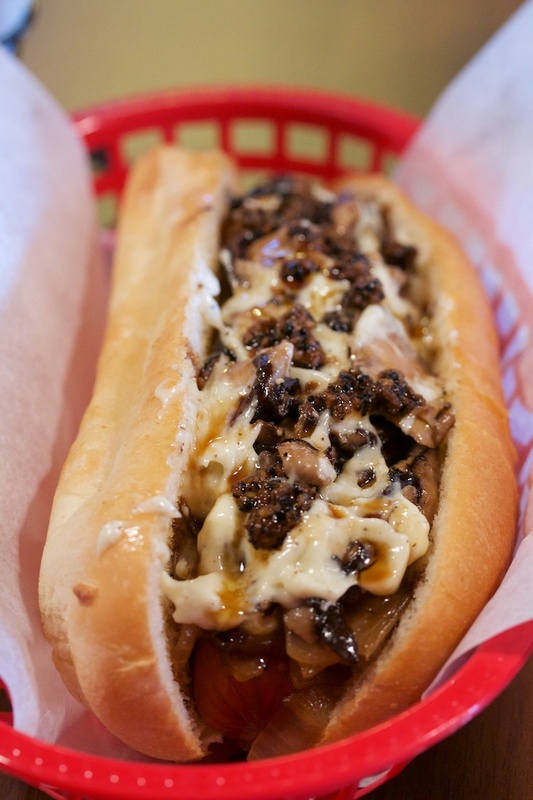 It consists of a 100% all Angus beef dog, caramelized onions, white truffle sautéed shiitake mushrooms, minced black truffle, truffled aioli, Umai teriyaki sauce and furikake [$12]. 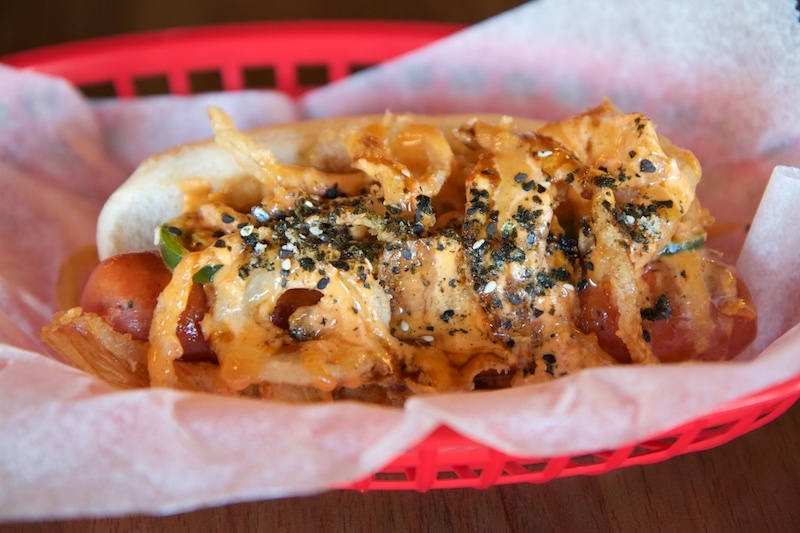 I didn’t notice it until after I ordered it, but this is basically the craziest dog on the menu and has a note that says it is made to order and is a 10 minute wait. 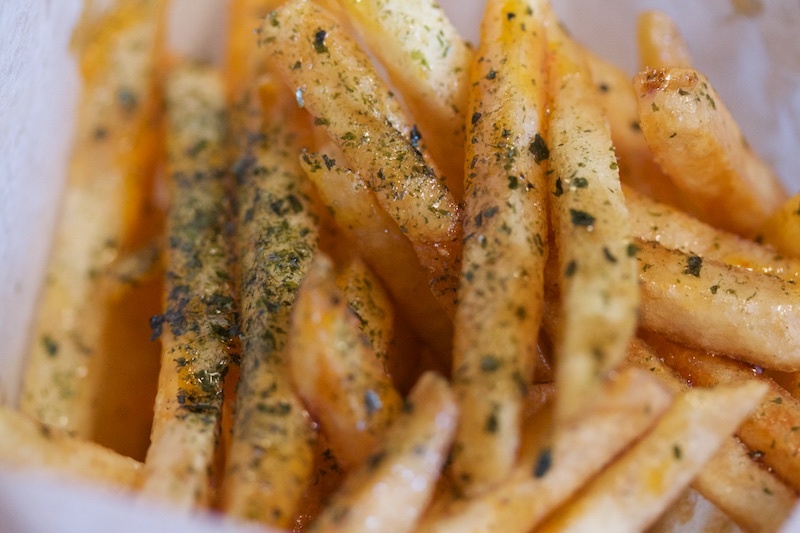 I made it a combo with fries and a drink and upgraded the fries to the Umai House Fries (French fries tossed with our seasoning mix, signature Umai Teriyaki glaze, Nori seaweed and topped with our Dynamite sauce). All together this came to $16.13 after tax. Pricy, but that Truffle Dog is what did it. Most of the dogs aren’t anywhere near that price. While I waited, a random rush formed and the place filled up quick. While my dog came within the 10 minutes, others were definitely seeing longer than usual wait times and there was a bit of confusion. Understandable for day 1. The truffle was immediately noticeable when the basket arrived at my table. It’s aroma is unmistakeable. People at the next table over mentioned that they could smell it. This thing was nuts. I don’t think I’ve ever had actual truffles in something, probably just sauces infused with the oil. This had the rich flavor in so many different ways at once that it was almost too much. Almost. 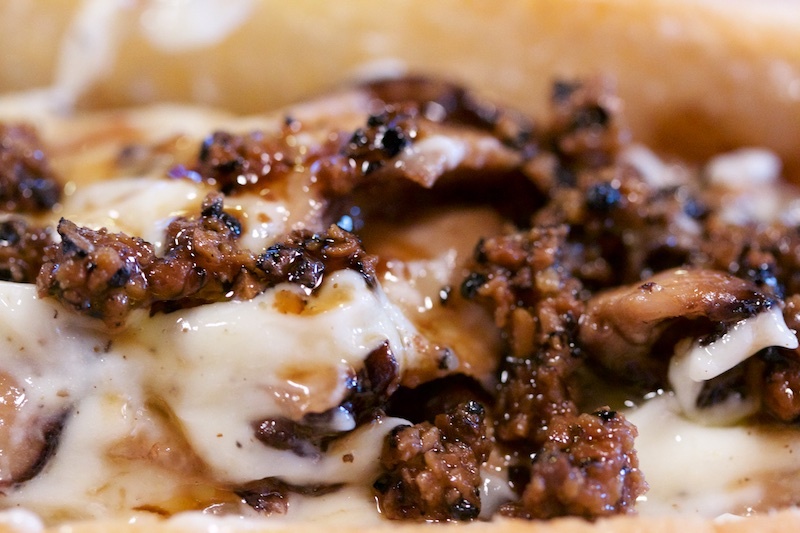 You need to put a small amount of effort into eating this, basically making sure you balance the amount of truffle-soaked toppings with each bite of the dog itself, or else it can be overwhelming. I had one bite of basically nothing but mushrooms, aioli, and truffles. That made my stomach turn slightly and had me being much more conscious of the ratio of dog to toppings I had from then on. With that mentality I was able to very much enjoy it greatly. 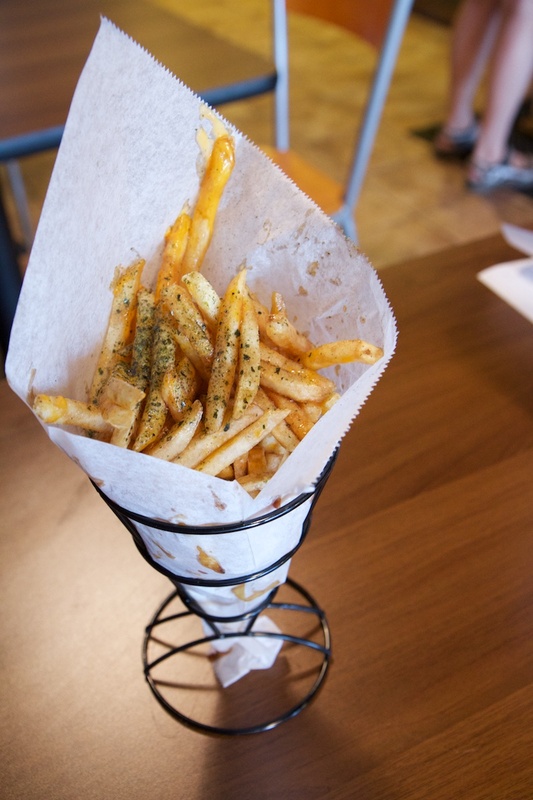 The Umai House Fries were pretty damn good. The teriyaki & dynamite sauces made it pretty messy, so I used a fork for most of it. The fries stayed crisp for quite a while, even with the sauce. Flavor-wise it was a mix of savory and sweet, with a bit of a lean towards sweet. I’d definitely like to try some of the other fry variations available. For soda on the first day something tasted off. I’m not sure what it might have been but today it was fixed and the Dr Pepper was on point. 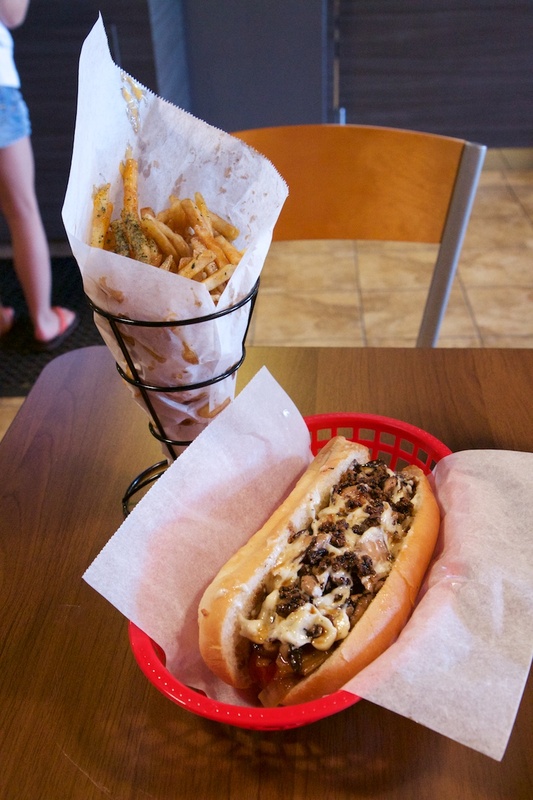 Today I tried one of the more “normal” signature dogs. 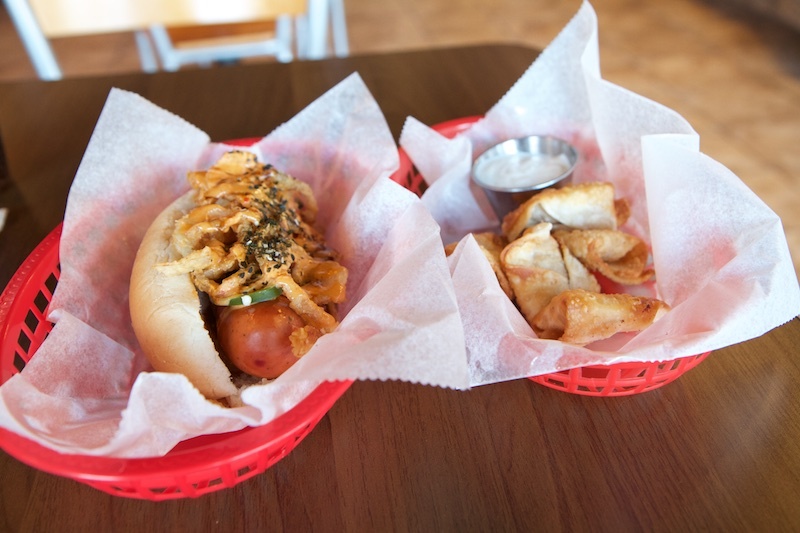 This was the Kyoto Fire (Hot Link, Batter Fried Onions, Yum Yum Sauce, Creamy Habanero, Unagi Sauce, Jalapeno Pepper Slices, Furikake)[$5] and went with an order of the Inu Rangoons (Smoked sausages, cream cheese and pepperjack cheese wrapped in won ton wraps and deep fried. Served with your choice of dips. 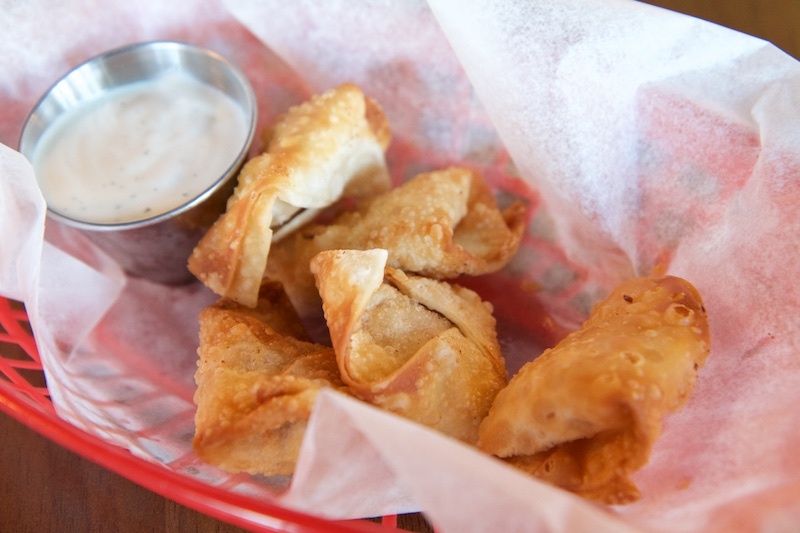 Choose between our Yokohama, Tokyo or Sapporo Rangoons)[$3]. They didn’t have the Sapporo version of these, which I think I recall the cashier describing as being the spicier of the three, as they hadn’t made them yet (I arrived right at opening). He hadn’t tried the Yokohama himself and wasn’t sure how to describe it, so I figured I’d see what it was all about. I was the only customer at the time so my food came pretty quickly. The Kyoto Fire arrived in just a few minutes and the rangoon followed a couple minutes later. I tried some of the rangoon first and they were extremely mild, basically tasting like cream cheese with hot dog. That probably sounds little boring but I did enjoy them. There was an option of ranch or sweet chili dipping sauce. I picked ranch, but really used very little of it because they were perfectly good on their own. The Kyoto Fire was delicious. The hot link itself had a really nice snap to it. The three sauces quickly started to saturate the bun, which was barely holding onto everything as it was, so this got messy quick. The heat in this was intense. For a good half hour or so after leaving Umai my lips were still burning a little bit. The creamy Yum Yum sauce might be intended to temper the heat a bit, but it’s still very spicy. The onions were nice, crisp and flakey. Overall I really enjoyed this hot dog. 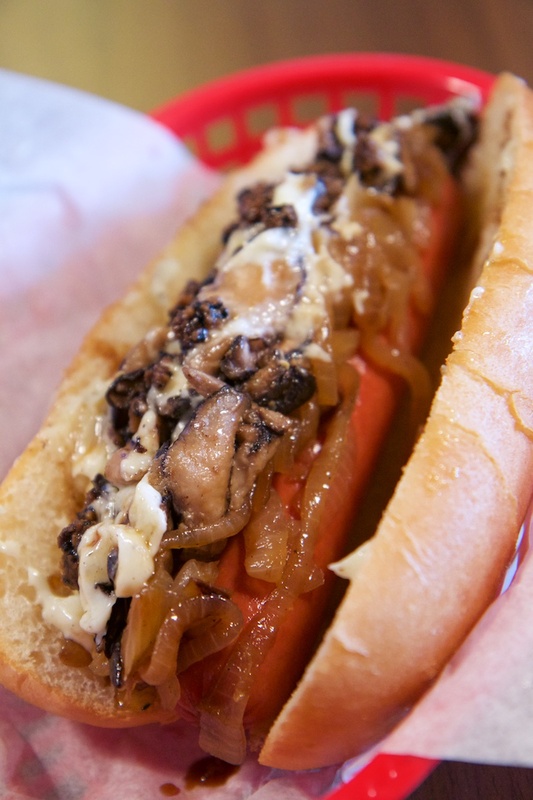 The Umai X Truffle Dog was a fun experience, almost a novelty. The price and richness will probably keep me from going back to it with any regularity though. I would definitely have the Kyoto Fire again, but I have 19 more to try out first! Safe to say I love this place and it somewhat fills a gap that was left when Knucklehead closed. I always enjoyed trying their wild creations. This place is very different, but has a lot of that experimental feel to it, just with a Japanese twist. Well, my plans for lunch today fell apart. I was going to go to The Green Boheme, a raw vegan joint tucked away behind Sports Page, but apparently Saturday is the only day they are closed! I’ll have to try again soon. 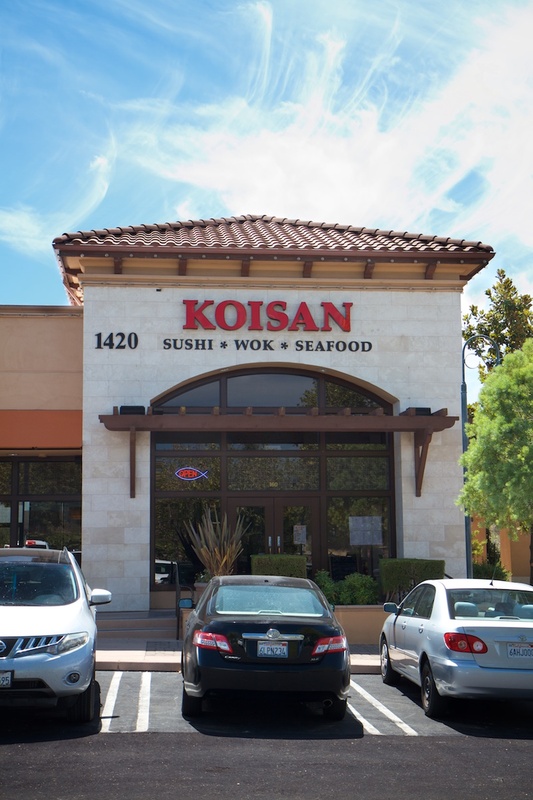 I reluctantly drove over to Koisan, a new restaurant in the cursed location that once held Tomi, Da Jung, and at least one other failed Asian/seafood buffet. I was not excited to come here just due to the history here. Nevertheless, I walked in a bit before 1PM. I stepped into the entryway and was greeted after about 20 seconds of eyeing the menus set on the front counter. I was taken in and to the exact same booth I sat at for my visit of Da Jung last time. 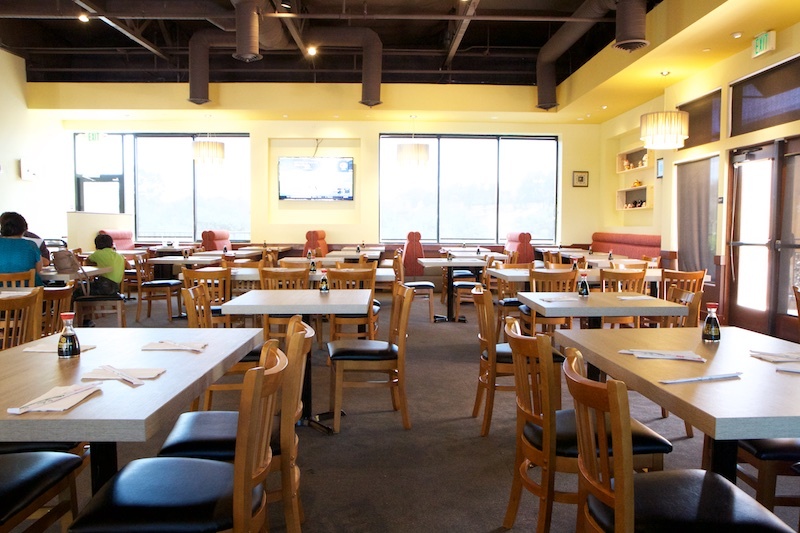 Not a whole lot has changed about the dining room through both Tomi & Da Jung, minus that fact that the Korean-BBQ tables are now gone. 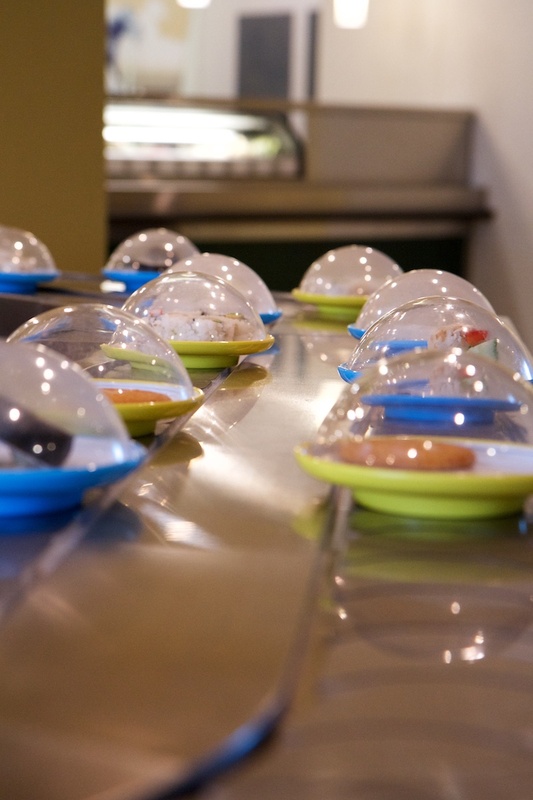 What was the sushi bar at Da Jung has been removed and converted to a conveyer with little dishes constantly on the move. The host showed me the menus, explained how all you can eat (AYCE) works and also told me about their special for lunch today, a bento box with a handful of different things. It was slightly overwhelming so I took plenty of time to go over everything once he left. It would be a few minutes until my server introduced herself and got my drink order. So they have a full on regular menu, which also is their take-out/delivery menu, where you can order all kinds of individual Chinese dishes. 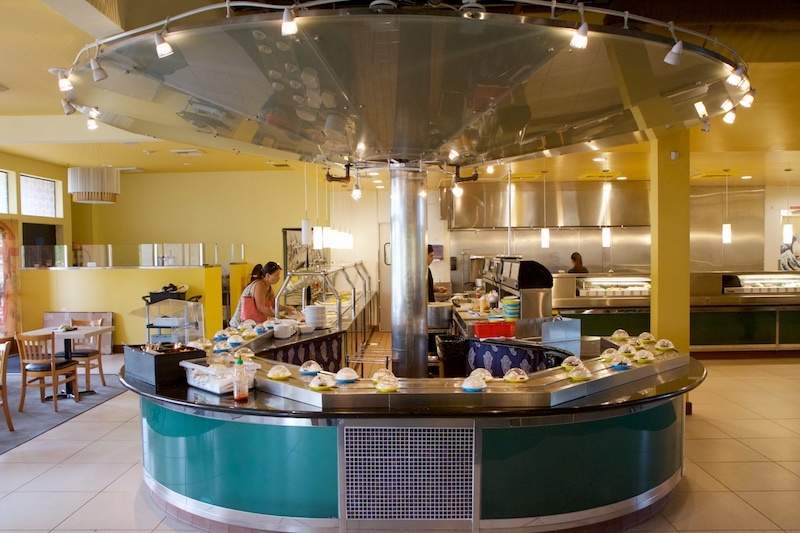 Then there’s the AYCE Lunch [$13.99] which consists of a combination of salad bar, a variety of pre-made items on the nifty little conveyor belt, and finally a menu of items that will be made to order. Dinner is similar but with a larger menu and a bigger price [$19.99, $21.99 on Fri/Sat] to go along with it. To be honest, I was not totally crazy about the idea of AYCA, again, mostly due to this locations past, so I skimmed over the lunch menu. 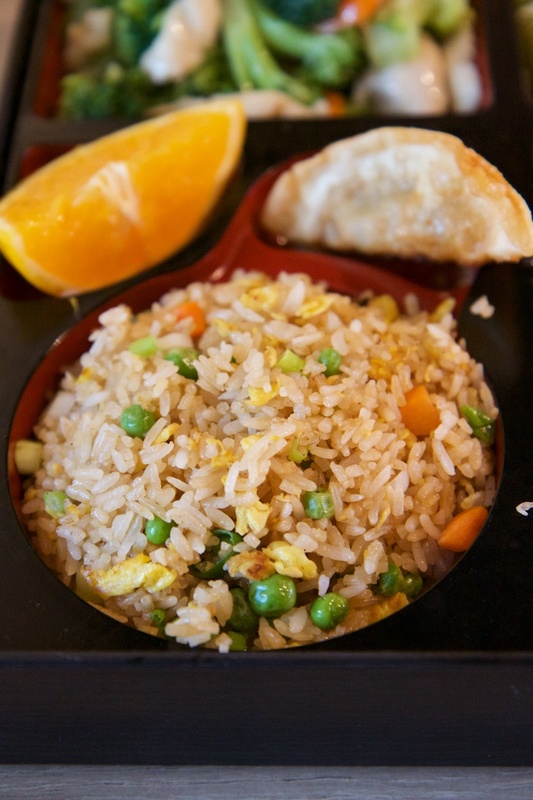 In addition to AYCE Lunch, they also had some lunch-time bento boxes where you could choose a Chinese wok item. I eventually asked about the special once more and went with that, because it seemed like a good variety and a good value. 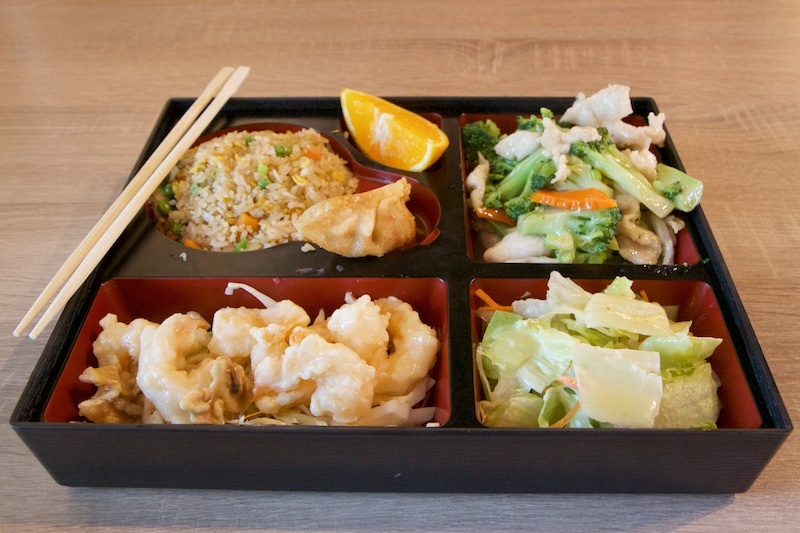 It was a bento box with honey walnut shrimp, broccoli chicken, rice (steamed or fried), salad, gyoza and miso soup [$10.95]. I got a soda to drink [$2.25]. 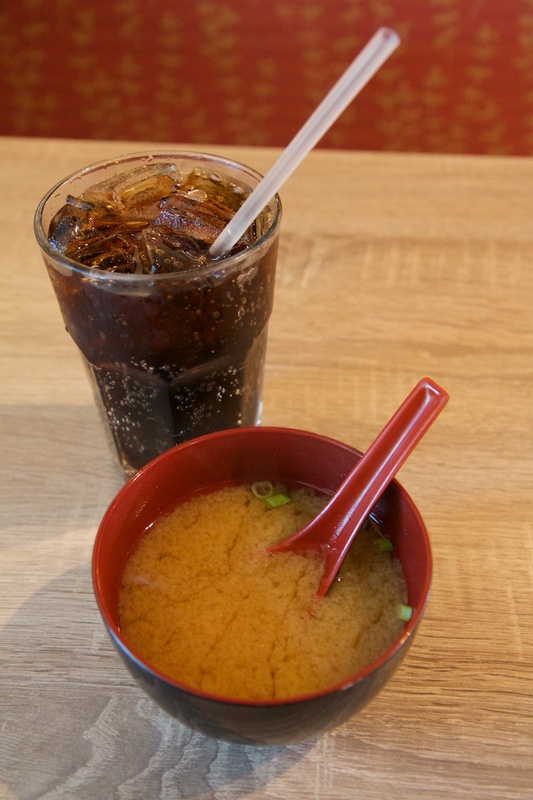 Within a few minutes I had my Mr Pibb and miso soup delivered. Both were excellent. The Pibb was nice and strong in flavor, as was the soup which was very hot. I had to let that cool off a bit. I was just finishing this up when my bento box was brought out. It was very snappy, coming just 7 minutes after the soup. The box was a good size and had quite a bit of food in it. I went to work. 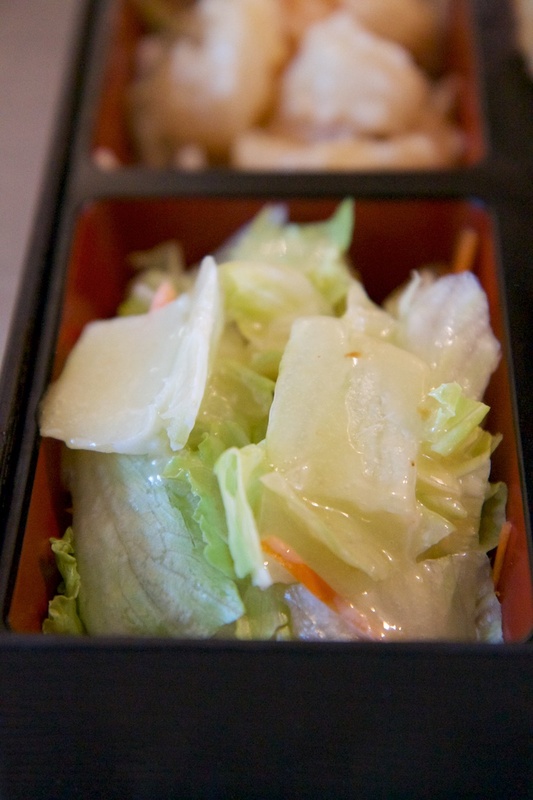 The salad was very basic, pretty much iceberg with little shaved bits of carrot and the usual sweet/creamy dressing that sushi joints use. It was cold, tasty and a nice way to start. After that I jumped around. I had chosen fried rice. I doubt this was made to order, but it seemed more fresh than something like you’d get at a panda express or certainly any kind of buffet. 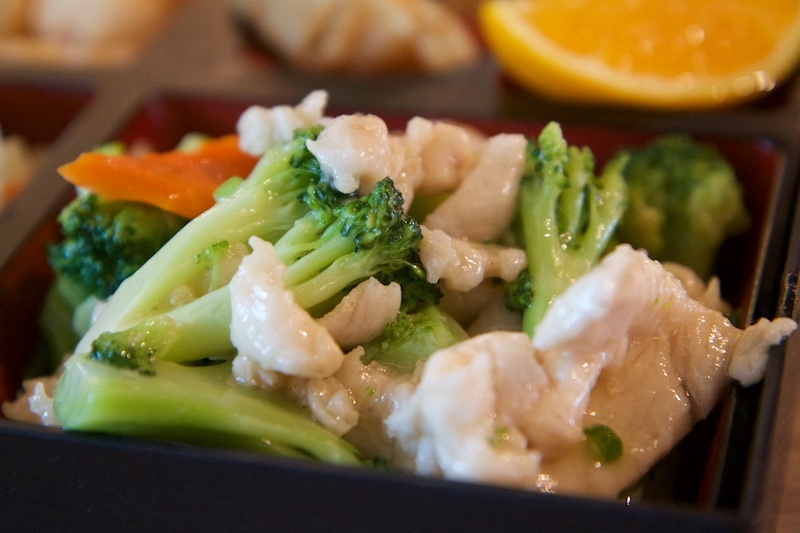 The broccoli chicken looked really boring, but to my surprise it was actually really delicious and whatever sauce it was cooked in was nice and savory. The chicken and broccoli were both very hot. The broccoli was cooked perfectly, not crunchy or mushy, it was just right in the vegetable Goldilocks-zone. 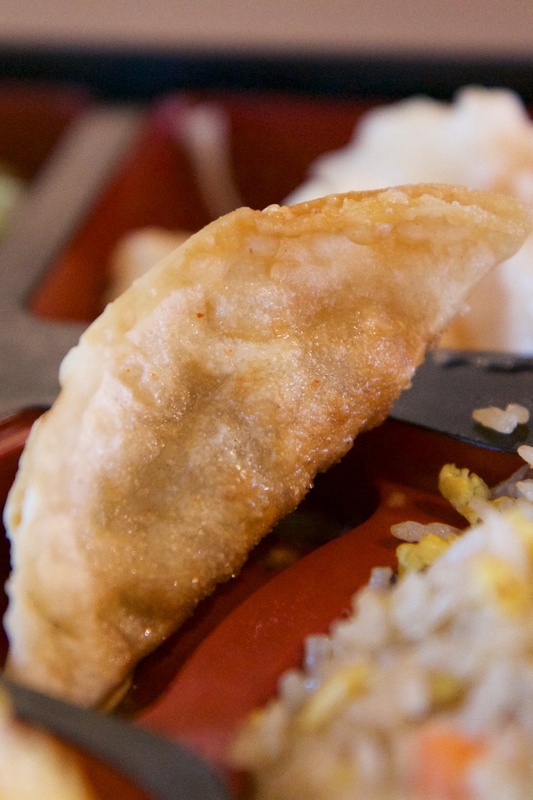 The gyoza was probably fried for my order as it was hot and crisp. There didn’t seem to be any sauce for it, but I think it might have been quickly dipped in some before being plated because that saltiness was present. It was very good. The honey walnut shrimp was OK. It was hot and the flavor was decent, but I didn’t find it to stand out in any way like some of the best of this dish in Roseville do (see Leo’s Kitchen or Bambu for outstanding versions of this dish). The walnuts were not very sweet like most places have them. 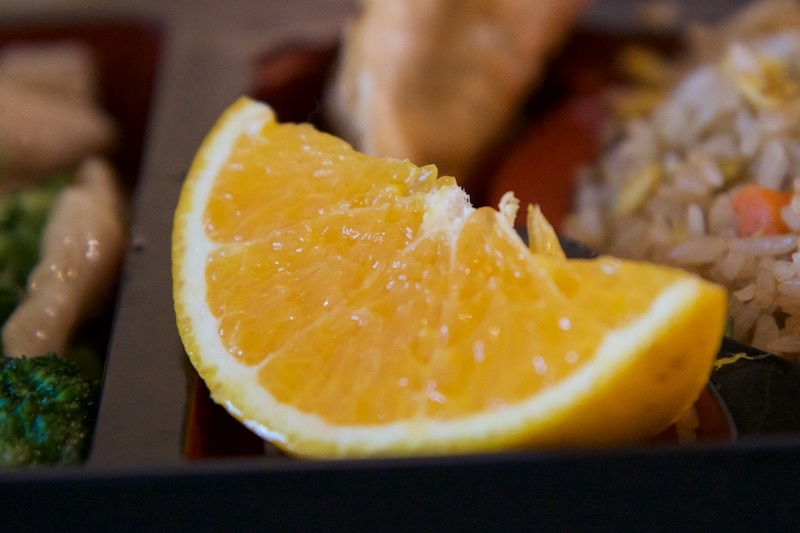 Finally, the orange was incredibly ripe, juicy and sweet. A perfect ending to a surprisingly satisfying lunch. I definitely had my reservations coming in here but they cleared those away. While the food was good overall, the service was even better. The host, my main server and a couple of the other servers that I interacted with were all excellent and seemed very eager to please. I might actually be inclined to come back and try the AYCE, both due to this initially good experience, and also because the sushi is made to order (a-la Raku Sushi), so It has some promise of being much, much better than previous businesses here. I’ve been crazy busy lately but I have my eyes set on a spot to try out by the weekend that I hope will be interesting (no spoilers!). For now here’s a quickie. 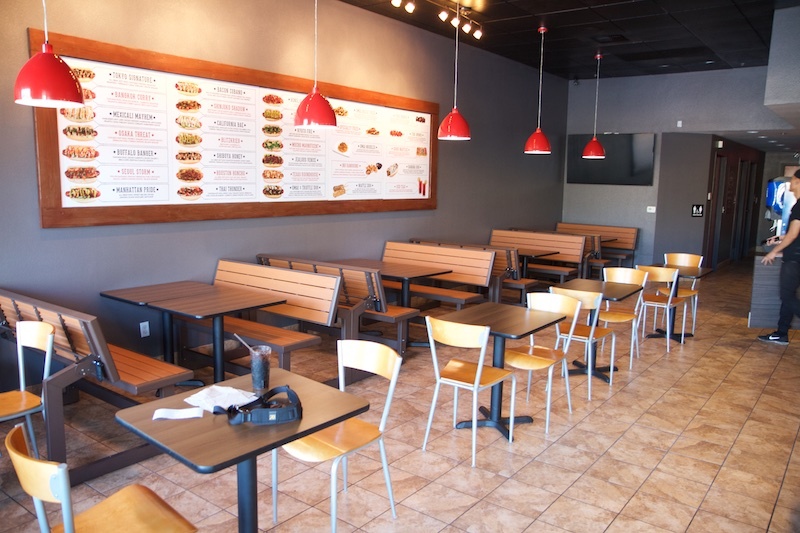 This is Firehouse Subs, a pretty big chain sub sandwich place that is new to the area. It’s located next to Habit on Pleasant Grove near 65. The place is quite large, for a sandwich joint, and decked out with firefighter gear & tools for decoration. They focus mostly on hot subs, there were only 2 cold ones that I saw on the website, a chicken salad sub and a tuna sub. I picked The Engineer (smoked turkey breast, melted Swiss, and sautéed mushrooms, served Fully Involved. “Fully Involved® – Loaded complete with mayo, deli mustard, lettuce, tomato, onion, and a kosher dill pickle on the side”) [$6.99 for a medium]. The menu didn’t seem clear that there were sizes other than medium, so I thought that referred to the soda. Eventually I saw a large delivered to a table nearby though and it was huge, maybe twice the size of the medium. Overall it’s a pretty good sub. Nothing mind blowing, however it beats the hell out of Subway and Quiznos any day. If you like hot sauce then they should have something for you, I counted about 40 unique bottles (click the image below to see a larger version).